Hi again gang! Back with another game review. This one is not so new, and actually has an expansion already out for it, but being that I'm not rich, nor have "the hook ups" to get things ahead of schedule, I'm reviewing as I get them... so, with out further ado... let us delve into the shadows, put on our darkest eyeliner, and toss the Twilight books into the trash as we head into the world of Nightfall! The first thing you'll notice is the box is very sturdy. Very much like Ascension's box for example. No worries that it'll like the Sorry or Clue game boxes in a few short weeks. However, it's a bit of a shock when you first open it... much like opening a bag of chips and realizing it's 75% air... In Nightfall's case, it's 75% foam. AEG provides you with foam inserts to separate the cards, and I must say, after setting it up, it looks quite nice and is handy given the high amount of set up. Gameplay takes a bit to understand, it's not a "jump right in" game. To describe it, I'll use my gametesting partner's words, "It's like playing a Gothic Uno." So what's that mean? Ivan is a White card, as shown by his moon in the upper left. I can then chain a Blue or Purple card from him. What's that kicker you ask? Well, first, when a Chain resolves, it go last in, first out. Each card looks to the card it's chained from, to see if the kicker matches the previous card's color. So for two examples, if I played Ivan and he was chained to a Green card (played prior to him) I would receive the kicker when he comes into play. 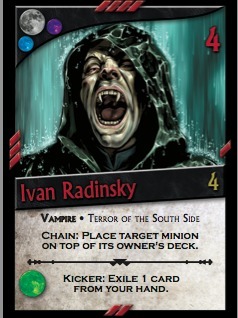 Or, if I play a blue or purple card chained to Ivan, and that card's kicker is White (as is Ivan) I get that card's kicker bonus. Sound confusing? It is, and it isn't. After about 3 or 4 games, you get it. But even still, the way games are set up, never ensures you'll be having even one option that is a powerful kicker combo. Each game starts with a draft. You and your opponents have 4 draft cards each, and you choose 1 and pass. Then you choose another and pass. These first two chosen cards will be your Personal Archives, which are purchasable for your main deck, but ONLY by you. Then everyone picks one of the two remaining draft cards they have to go in the Common area, and the final is discarded. Then, you flip the remaining draft cards from the draft deck face up until eight cars are in the common area. So everyone has two piles of cards they can acquire only for them, and eight general that anyone can buy. This offers a lot of options, but at times, there isn't always a clear kicker combo. To boot, your opponent's play on your chains, and you on theirs. So while it's my turn, I can start my chain to bring in creatures and play abilities, and when I'm done, the last card I played opens it up to the person on my left. There are a lot of fun actions and happenings resolving a chain, however, be warned, the more people playing (the base game is up to 5) means the more insanity in a chain! We played with a max of four and it honestly was so much, we needed a "dealer button" to remember whose turn it was! The win condition is simple, through attacking and damage your opponent and their minions, you will give your opponent's Wound cards. Whoever has the least amount of wounds at the end of the game wins. If there is a tie, there are three types of wounds, the tied players compare the amount of their largest type of Wound (Bite, Burn, Bleed) and the person with the highest amount of any one loses. If you read that well enough, you also saw that Wounds go into your deck, taking up space. They both allow you to draw cards, but also increase the odds of you losing! Overall, the artwork is great. The style of the cards is excellent and everything is clearly presented. It was one of the first games I've played out of the box that didn't have me guessing what the text meant. That said however, the gameplay, and the cards themselves, never really (outside of the artwork) made me feel as though I was in Underworld battling for Lycanthropic supremacy! The game in fact, could have Strawberry Shortcake vs the Care Bears on the art and I'd never know the difference in the gameplay. It is nice though to play Chain cards on your opponent's turn. This is the best part of the game, as you don't play like other deck building games where I sit and wait for someone to finish. You are right in it, all the time. 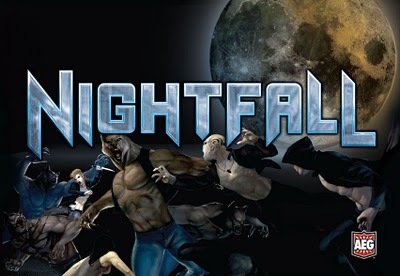 It's the first game I've played in a long time that really didn't make me feel connected with it's genre and that was too bad as overall, it leaves you wanting more. There is, as mentioned, an expansion, however, with the lack of fun I've had playing the game over a dozen times, I don't believe I'll be looking at it. It's a fun game, and once you get the Chaining down, it's neat to put a 3 or 4 card chain together. However, the lack of connection with the genre in gameplay, the conundrums that take effect with 4 or 5 players in Chains, and the painful realization that one good chain wins almost every game makes me unfortunately have to recommend this game with caution. If you have a local game shop that can do demos, I highly suggest that. It may be your cup of blood, er, tea, but unfortunately, it wasn't mine. Later... suckers (ok, even I admit, that was a terrible pun).